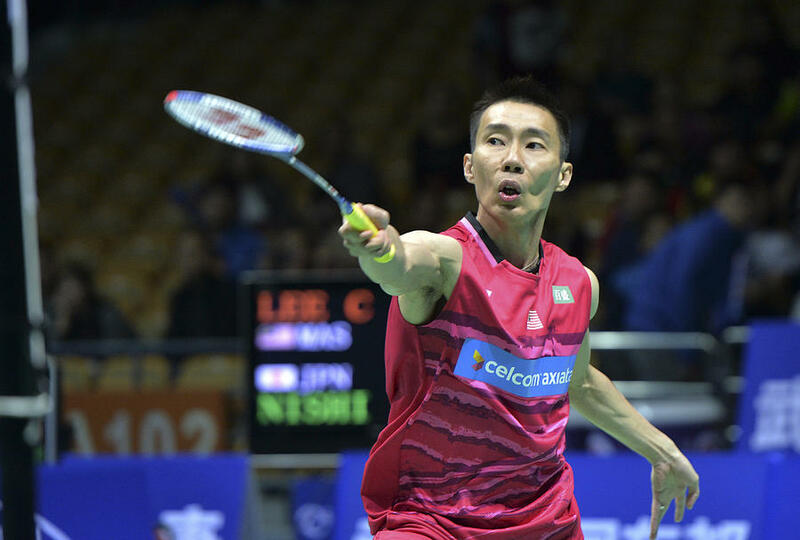 Today, the Asia Badminton Championships has begun at Wuhan Sports Center Gymnasium in China. 255 players from 21 nations are participating in this edition and the total prize money is USD 400,000. India will be represented by Kidambi Srikanth and Sameer Verma in men's singles and P.V. Sindhu and Saina Nehwal in women's singles. The 2019 Badminton Asia Championships is the 39th edition of the Badminton Asia Championships. This tournament is hosted by the Chinese Badminton Association, with the sanctioned from the Badminton Asia. UNESCO at its General Conference held in Paris chose 23rd of April to celebrate World Book Day as it is a highly symbolic date for world literature in 1995. English has an official or special status in at least 75 countries that have a total population of over two billion. The day was established in 2010 by the Department of Public Information, as a result of its efforts to establish language days for each of United Nation’s six official languages. Manish Maheshwari (CEO of Network18 Digital) has been appointed as the Managing Director (MD) of Twitter (U.S.-based microblogging platform) for India operations. Mr.Maheshwari takes over from interim head Balaji Krish. He will be responsible for driving an integrated business strategy to accelerate Twitter’s audience and revenue growth in the country. As of 2018, Twitter had more than 321 million monthly active users. Sunil Kumar Gautam (IPS-officer) has been honoured with the Pandit Govind Ballabh Pant Award for the year 2018-19 for his book ‘Samvidhan Kavya’(Constitution of India in Poetic form). The award was presented by the Bureau of Police Research and Development (BPR&D), Ministry of Home Affairs, Government of India. The book depicts the Constitution of India in a very simple and poetic form to make it understandable to the common man in a very simple manner. In addition to this, books of four other police officers from across the country have also been rewarded. The selection of books was done in the meeting of the evaluation committee under the chairmanship of Sudip Lakhtakia, Director General, BPR&D. Professor Gagandeep Kang (56-year) has become the first Indian female scientist to be elected as a Fellow of the Royal Society (FRS) in the UK fellowship’s 358-year-history. Dr Kang is known for her inter-disciplinary research studying the transmission, development and prevention of enteric infections and their sequelae in children in India. She is the Executive Director of Translational Health Science and Technology Institute at Faridabad. Other notable FRS inducted in 2019 include Fields Medal-winning mathematicians Akshay Venkatesh and Manjul Bhargav. SBI General Insurance (SBIG) has launched a product to protect businesses from financial and reputational losses due to cyber-attacks. In the initial phase, it will focus on small medium-sized enterprise (SME), mid-market businesses. The new insurance plan of SBI General Insurance comes with CyRUSS (Cyber Risk Underwriting and Solution Suite). CyRUSS is a cloud-based tool for commercial cyber policies including risk assessment, ongoing risk management and claim management as well. SBI General Insurance Company Limited is considered one of the leading non-life insurers in India. It is a joint venture between Insurance Australia Group (IAG) and the State Bank of India. The first edition of Naval Commanders’ Conference of 2019 has begun in New Delhi. The three days conference is the apex forum within the Service for interaction between the Naval Commanders. It will provide the higher naval leadership a forum to discuss the emerging challenges in the maritime domain. The conference also serves as a platform for interaction of Naval Commanders with senior Government Officials. The veteran lady mountaineer of the country Rama Sengupta Paul (66-years) has passed away following a cardiac arrest. She led the first successful all-women expedition to Krdarnath Dome in Garhwal Himalaya. Rama was a member of Indo-Japanese Women expedition to Kamet and Abi Gamin organized by Indian Mountaineering Foundation in 1976. Mount Agung on Indonesia's resort island of Bali has erupted again (last eruption in 1963). The volcano's status remains on alert, or level three of four possible levels and authorities continue to impose a 4-kilometre exclusion zone. Thousands of masks have been distributed to the communities amid the fears of the ashes impacting human respiratory. Mount Agung is situated in Karangasem district and about 70 km from tourist hub Kuta. Saudi Arabia (first G20 meeting in the Arab world) will host the G20 summit on 21-22 November 2020 in its capital Riyadh. First-ever ‘Japan’ will host this year's G20 summit in Osaka (28-29 June 2019). The G20 (Group of Twenty) is an international forum for the governments and central bank governors from 19 countries and the European Union. 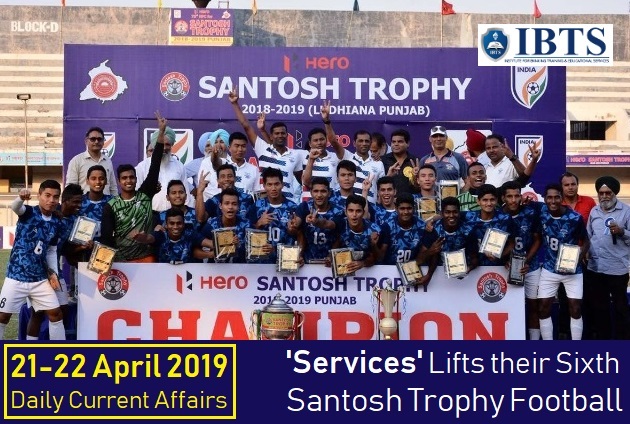 'Services' has won the 73rd edition of premier domestic football tournament ‘Santosh Trophy’ by defeating Punjab 1-0 in the final at Ludhiana, Punjab. In the second half, Services scored the lone goal and held on till the final whistle. In the 1st semi-final, Punjab (eight-time champions) had defeated five-time winners Goa (five-time winners) 2-1 to enter their 15th final. In the 2nd semi-final, Services beat Karnataka 4-3 via a penalty shootout to book a place in the title clash for the 11th time. Santosh Trophy is an annual Indian football tournament started in 1941. The trophy is named after the late Maharaja Sir Manmatha Nath Roy Chowdhary of Santosh (now in Bangladesh). It is knock-out competition contested by the regional state associations and government institutions under the All India Football Federation (AIFF). India cricketers Hardik Pandya & K.L. Rahul were fined 20 lakh rupees each by the BCCI ombudsman Justice D.K. Jain for their sexist comments on a popular TV chat show. Justice Jain wrote that no further action will be taken against Pandya and Rahul. In the order published on the official BCCI website, they have already served a provisional suspension and tendered an unconditional apology for their loose comments on women. The Asian Weightlifting Championships 2019 has begun in Ningbo, China. As many as 278 participants from 28 nations and regions, including China, Japan, South Korea, India, Iran and North Korea have registered for the competition. Former World Champion, Mirabai Chanu (in 49kg category) will spearhead India’s challenge at the Championship. Medals will be won across 20 categories, 10 for men and 10 for women, till the 28th of April 2019. The Asian Weightlifting Championships is a weightlifting championship organised by the Asian Weightlifting Federation for competitors from the Asian countries. It is the 48th men's and 29th women's championship. Italian Tennis Player Fabio Fognini has won the 2019 Monte-Carlo Masters. He defeated Dusan Lajovic (Serbia) 6−3, 6−4. Croatia’s Nikola Mektic & Franko Skugor has won the 2019 Monte-Carlo doubles title, defeating Robin Haase & Wesley Koolhof in the final, 6–7, 7–6, [11–9]. The 2019 Monte-Carlo Masters (113th edition) is an annual tennis tournament (outdoor clay courts) for male professional players held in Roquebrune-Cap-Martin, France. Punia secured 58 points ahead of Akhmed Chakaev of Russia. Punia won Gold in the Asian Games and Commonwealth Games as well as a silver in the World Championships last year. He won gold at the Dan Kolov-Nikola Petrov tournament in Bulgaria last month. The theme for 2019 International Mother Earth Day is " Protect our species", which aims to draw attention to the rapid extinction of species across the world. The World Creativity and Innovation Day (WCID) has been celebrated on 21st April to raise awareness of the role of creativity and innovation in problem-solving and by extension, in the implementation of the Sustainable Development Goals. The civil services day is not being observed due to the general elections. The civil services day is celebrated on 21st April every year when bureaucrats rededicate themselves to public service, and awards for excellence in public administration are also conferred. It was on this day that Sardar Vallabh Bhai Patel, addressed the first batch of civil servants in Independent India at the Metcalf House where he referred to civil servants as the 'steel frame of India'. Prominent scientist and businessman ‘Yusuf Hamied’(82-year) is among a host of Indian-origin experts honoured in the 2019 list of new fellows of the UK's Royal Society. Mr. Hamied’ is the chairman of pharmaceutical major Cipla. Fellowship of the Royal Society (FRS) is an award granted to individuals that the Royal Society of London judges to have made a 'substantial contribution to the improvement of natural knowledge, including mathematics, engineering science and medical science'. Noted Bengali folk singer Amar Pal (86-years) passed away in Kolkata after a prolonged illness. His playback in Satyajit Ray directed Hirak Rajar Deshe 'Kotai Ranga Dekhi Duniya' was one of the hit songs among Bengali circles. He was an old artist of Akashvani Kolkata and remained closely associated with this prestigious institution. The West Bengal Government conferred Sangeet Mahasamman on him in 2012 for his outstanding contribution in the field of music. The Indian Navy launched guided missile destroyer Imphal at Mazagon Dock Shipbuilders in Mumbai. According to enhanced stealth features have been achieved through the shaping of hull and use of radar transparent deck fittings which make the ships difficult to detect. Navy has become a builder from a buyer and was slated to excel in coming years. The UAE Cabinet chaired by Sheikh Mohammed bin Rashid Al Maktoum has adopted the National Artificial Intelligence Strategy 2031 at the Presidential Palace in Abu Dhabi. Its aims at positioning the UAE as a global leader in artificial intelligence by 2031 and to develop an integrated system that employs artificial intelligence in vital areas in the country. According to Sheikh Mohammed bin Rashid, The UAE is moving ahead with its vision and aspirations through a well-defined plan for the UAE Centennial 2071. The strategy includes eight objectives and number of initiatives, aimed at employing artificial intelligence in vital areas such as education, government services and the community wellbeing. The strategy implementation is overseen by the Emirates Council for Artificial Intelligence and Digital Transactions, in coordination with the number of local and federal entities. Political newcomer, Comedian ‘Volodymyr Zelensky’ (41-year) has won the 2019 Presidential election of the country in a landslide victory. He won 73% of the vote in the runoff election, according to national exit poll results broadcast by Ukrainian television. The president is directly elected by the citizens of Ukraine for a five-year term of office, limited to two terms consecutively. Mr Zelensky is best known for starring in a satirical television series Servant of the People in which his character accidentally becomes Ukrainian president. Ukraine (more than 40 million people) is a large country in Eastern Europe known for its Orthodox churches, Black Sea coastline and forested mountains. 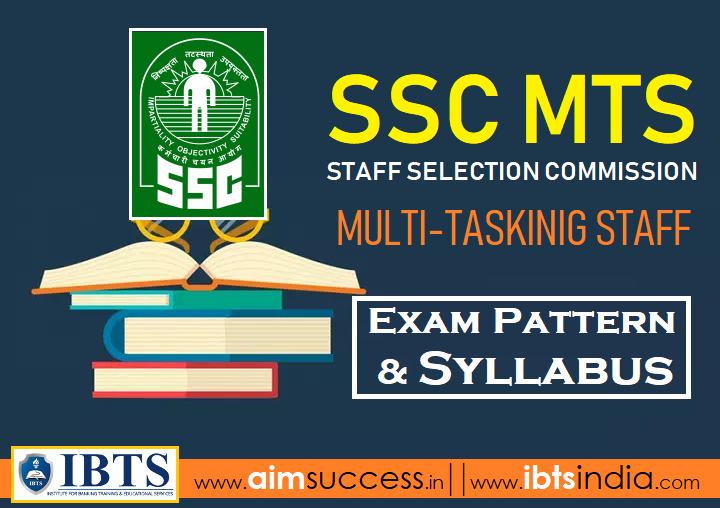 SSC MTS Syllabus 2019: Staff Selection Commission (SSC) will organize MTS Paper 1 & Paper 2 written exam for the post of Multi Tasking Staff (Non-Technical) MTS in Different States and Union Territories. All those Candidates who is interested in these Posts Filled their Online Application Form. Application Submission Process is Started From the Date 22.04.2019 & Conducted Till the Date 22.05.2019. Candidates Can Check the Detailed Information About the Recruitment from the Below Provided Link. The SSC MTS notification has been released by Staff Selection Commission. 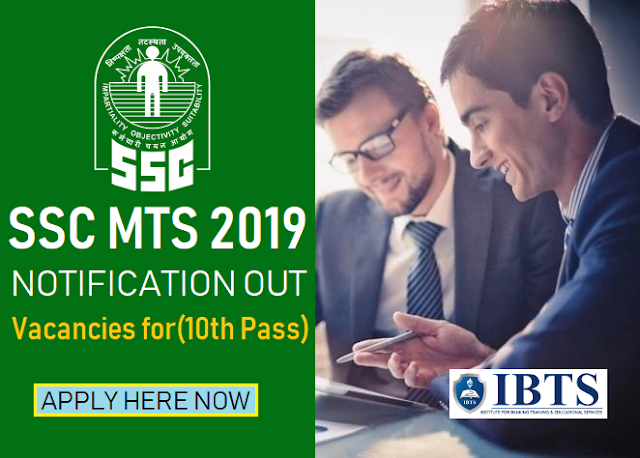 The SSC MTS Paper I will take place from 2nd August to 6th September 2019, whereas Paper II will take place on 17th November 2019. With just a few months left for the SSC MTS exam, it is high time you start your exam preparations. You are advised to prepare for the SSC Multitasking Staff exam in accordance with the official syllabus and exam pattern. The SSC MTS syllabus consists of General Intelligence and Reasoning, Quantitative Aptitude, General Awareness, English Language sections. We have given below the complete SSC MTS syllabus 2019 for each section along with the PDF attached at the end to download for free. Now let's take a look at the section-wise SSC MTS syllabus 2019, which is mentioned below. You can also check the study material to boost your preparation. Step II: Paper-II will only of qualifying nature. The cut-offs in Paper-I and qualifying marks in Paper-II may be different for vacancies in each State/ UT will be fixed at the discretion of the Commission. Point 1: Paper-I will consist of Objective Type- Multiple choice questions only. 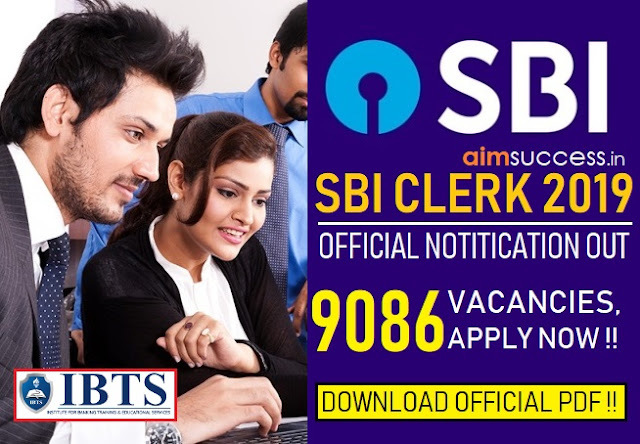 SSC Recruitment 2019:- SSC MTS 2019 Notification Out. The Staff Selection Commission has timely uploaded Multi Tasking (Non-Technical) Staff notification for the year 2019. Candidates who are 10th pass can apply for the MTS post in various government organizations through a common link. With the release of MTS notification, SSC has also fixed dates of exam. SSC MTS 2019 exam will be held from 2nd Aug to 6 Sep 2019. Let us now go through some essential pointers like Important Dates, the number of vacancies, Eligibility Criteria, Application procedure, Selection process, etc to get more details of the recently released SSC MTS 2019 Notification. The candidates must have passed Class X (Matriculation) Examination or equivalent from a recognized Board. Candidates who have not yet acquired but will acquire the educational qualification and produce documentary evidence from the Board in support thereof as on 1 Aug 2019 are also eligible. Vacancies will be determined in due course. There is no update from SSC regarding the number of vacancies. It is to be noted that the vacancies for MTS will be released in two age groups i.e. (i) 18 to 25 years and (ii) 18 to 27 years. Online fee can be paid by the candidates up to 31 May (5.00 PM). However, candidates who wish to make the cash payment through Challan of SBI may make the payment in cash at the Branches of SBI within the working hours of bank up to 1 June provided the Challan has been generated by them before 31 May (5.00 PM). Eligible candidates may apply online at SSC's website (direct link is given below) from 22 Apr 2019 to 29 May 2019 till 05:00 PM. Here we end up our article on SSC MTS Notification 2019. If you have any queries regarding the recently released SSC MTS Notification, please feel free to write it in the comments section below. The ‘UN Chinese Language Day’ is observed every year on 20th April to promote the use of Chinese language in United Nation (UN). The day was chosen as the date for the Chinese language to pay tribute to Cang Jie, a mythical figure who is presumed to have invented Chinese characters about 5,000 years ago. America’s first female astronaut candidate pilot Jerrie Cobb(88-years) passed away in Florida following a brief illness. Altogether, 13 women passed the arduous physical testing and became famous as the Mercury 13. Scotland all-rounder Con de Lange (38-years) passed away after a lengthy battle with a brain tumour. The South Africa-born player played 21 international matches for Scotland, making his debut in a T20I against Ireland in June 2015. It is the story of an ageing travelling salesman who falls in love with a TV star and sets off to drive across America on a quest to prove himself worthy of her hand. India's Ambassador to the UAE Navdeep Singh Suri has launched a book containing English translation of the 100-year-old classic Punjabi poem about Jallianwala Bagh massacre, 'Khooni in Abu Dhabi. The poem was translated by Mr Suri whose grandfather Nanak Singh (Jallianwala Bagh survivor) wrote it after witnessing first-hand the events of April 13, 1919. On this ill-fated day, British troops fired upon crowds of protesters peacefully demonstrating against the Rowlatt Act of the British Raj, leading to the loss of well over a thousand lives. Saudi Arabia has issued a formal order increasing the Haj quota of India to two lakhs from one lakh seventy five-thousand. In February 2019, the Saudi Crown Prince Mohammed bin had announced that Indian Haj quota would be increased by 25 thousand to two lakhs. This is the third hike in three consecutive years. As many as 2,340 Indian Muslim women will go for the pilgrimage without a male companion or Mehram. The Hajj is an annual Islamic pilgrimage to Mecca, the holiest city for Muslims, and a mandatory religious duty for Muslims that must be carried out at least once in their lifetime by all adult Muslims who are physically and financially capable of undertaking the journey. It is one of the five pillars of Islam, alongside Shahadah, Salat, Zakat, and Sawm. The Union government has suspended the LoC trade in Jammu and Kashmir. The decision was taken as the government has been receiving reports that the Cross LoC trade routes are being misused by the Pakistan-based elements for funnelling illegal weapons, narcotics and fake currency. The trade is allowed through two Trade Facilitation Centres located at Salamabad, Uri, District Baramulla and Chakkan-da-Bagh of District Poonch. The main objective of allowing LoC trade between Jammu and Kashmir and Pakistan occupied areas of Jammu and Kashmir was to encourage local trade and exchange of locally made and grown products. The trade is based on the Barter system and zero duty basis. The 7th China International Technology Fair (CSITF) opened in Shanghai, China. The national-level professional fair has five exhibition areas including professional technologies, technological innovation, and trade services. Nearly 1,000 companies and organizations are attending the fair, including more than 20 companies and organizations from the British city of Liverpool. Research centres from Germany displayed their air filters and other latest technologies. The CSITF has become an important showcase for the latest technologies worldwide since 2013 when the first exhibition was held. Mali's Prime Minister has resigned along with his entire government after it came under mounting pressure over handling the violence in the restive Mopti region. The rage was rising especially after a massacre in which 160 people were killed in the village of Ogossagou near the border with Burkina Faso (on 23rd March 2019). Tens of thousands of people took to the streets of Bamako on April 5 to protest the upsurge of violence, accusing the government of not doing enough to stop it. Mali has been struggling to restore stability since Islamist extremists linked to Al-Qaeda took control of the country's vast desert north in early 2012. Pakistan's Finance Minister Asad Umar abruptly quit the Cabinet before securing a multi-billion dollar International Monetary Fund bailout package for the cash-strapped country. The Ministry of Finance is a ministry of the Government of Pakistan tasked to ensure a strong Pakistani economy by developing policies of sound economic management and providing expert advice to the government. Jaideep Sarkar (1987-batch Indian Foreign Service officer) has been appointed as India's next High Commissioner to South Africa. Currently, Sarkar is serving as India's ambassador in Bhutan. He served in Indian Missions in Tokyo, Seoul and Bangladesh as well. The government also appointed Suhel Ajaz Khan as India's next High Commissioner to Lebanon. Currently, he is serving as India's Deputy Chief of Mission in Saudi Arabia. Germany-based lender Deutsche Bank has appointed Kaushik Shaparia as the chief executive officer (CEO) for India. Kaushik Shapariao succeeds Ravneet Gill (joined Yes Bank last month). Shaparia served as Asia Pacific Head of Corp­orate Banking Coverage within Institutional and Treasury Coverage, as well as Global Head of Subsidiary Coverage. The bank is operational in 58 countries with a large presence in Europe, the Americas and Asia. The theme of World Liver Day 2019 is 'Love Your Liver and Live Longer’. 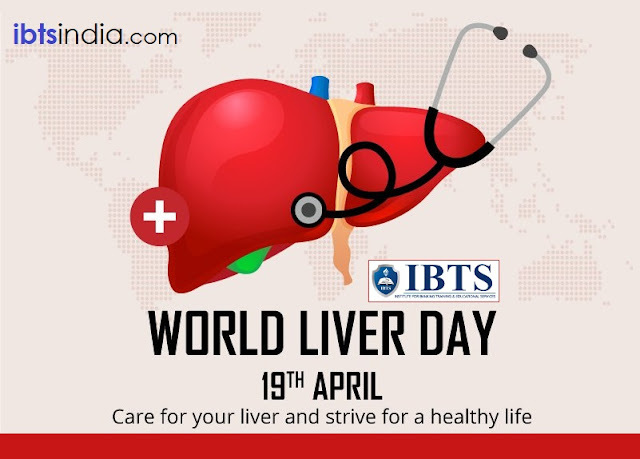 The liver is the second largest and the most complex organ in the body (first-brain). In humans, it is in the right upper quadrant of the abdomen, below the diaphragm. ICICI Bank has announced the launch of insta car and two-wheeler loans that will provide existing customers final sanction letters instantly. The second initiative, named 'Insta Two-Wheeler Loan', offers over 12 million pre-approved customers the facility to get instant sanction of loan up to Rs 2 lakh for a tenure of up to three years. Both the plans will offer 100 per cent of the on-road price of vehicle. Bank of Maharashtra (BoM) has partnered with M1Xchange Trade Receivables Discounting System (TReDS) platform for MSME bill discounting. TReDS is a digital platform to support micro, small and medium enterprises (MSMEs) to get their bills financed at a competitive rate through an auction where multiple registered financiers can participate. Mynd Solutions is a technology management firm which runs the TReDS platform of M1Xchange. The main purpose of TReDS platform is to facilitate smooth flow of liquidity in the system and make finance available at a competitive rate. ACI Worldwide announced that Canara Bank has successfully rolled out major new functionality to support EMV card acquiring across its ATM network and Aadhaar Authentication. Canara Bank is the first public sector bank to shift to EMV chip and PIN for card present transactions across the country’s vast ATM network. Canara Bank has nearly 6,300 branches and a network of more than 10,000 ATMs. The Reserve Bank of India (RBI) had mandated all banks to migrate the magnetic strip based ATM/Debit cards to EMV chip-and-PIN payment cards by 31st December 2018. Fincare Small Finance Bank (SFB) has been awarded the prestigious Celent Model Bank 2019 Award in the category of Financial Inclusion, for 'Redesigning Lending to Reach Small Businesses'. Fincare Small Finance Bank serves the banking needs of banking-savvy consumers across metro, urban and semi-urban markets. Fincare Small Finance Bank commenced banking operations on the 21st of July, 2017, after receiving the final license from the RBI under Section 22 of the Banking Regulation Act, 1949. As of March 2019, Fincare SFB serves, over 15 lakh customers in 12 States and 1 Union Territory. The International Monetary Fund (IMF) and the World Bank have launched their own private blockchain and digital currency network to familiarize staff with the concepts of cryptographic assets such as Bitcoin (BTC) and Ether (ETH). The new pseudo-token has been named as “Learning Coin” (no real value), purpose to teach relevant individuals within the organizations about blockchain. Staff members will earn the tokens by successfully clearing training goals. TIME magazine has released the Time 100 Most Influential People 2019 list. According to TIME magazine, Three Indians Mukesh Ambani (Reliance Industries Chairman), Arundhati Katju (public-interest litigators) and Menaka Guruswamy (fought for the LGBTQ+ rights) has been named in the list. Google has opened its first African artificial intelligence (AI) centre in Accra, Ghana. The research laboratory will host software engineers and research scientists to work on projects dedicated to next-generation technology. The centre engages directly with African universities by providing grants and PhD scholarships to students interested in AI. Google also supports graduate programs in machine intelligence at the African Institute for Mathematical Sciences in Rwanda. AI can be applied in sectors such as agriculture, health, and education, and Moustapha Cisse, the research scientist heading up Google's AI efforts in Africa. This new division is intended to give a coherent architecture to the policy, which was articulated by the PM Modi at the Shangri-La Dialogue in 2018. The Indo-Pacific division is intended to give a coherent architecture to the Indo-Pacific policy articulated by PM Narendra Modi at the Shangri-La Dialogue in 2018. Google and Apple have removed the Chinese internet firm Bytedance’s social media app TikTok in India from the Play Store and App Store following directions of the Ministry of Electronics and Information Technology to do so. Earlier, Madras High Court that had directed the Centre to ban TikTok app over concerns about access to pornographic content through it. People who already have the app downloaded in their devices will be able to continue using it on their smartphones. TikTok is an iOS and Android media app for creating and sharing short videos. The application allows users to create short music videos of 3–15 seconds and short looping videos of 3–60 seconds. 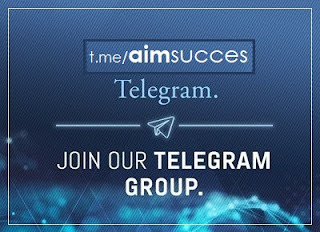 It is a leading short video platform in Asia, the United States, and other parts of the world. The Indian Navy held the 2nd edition of the bilateral maritime exercise between the Indian Navy and Vietnam Peoples’ Navy at Cam Ranh Bay, Vietnam. INS Kolkata under the command of Captain Aditya Hara and INS Shakti under the command of Captain Sriram Amur participated in the exercise. Indian women’s cricket team captain Mithali Raj has been named the goodwill ambassador of ‘Team India’ at the Street Child Cricket World Cup (SCCWC). The Street Child Cricket World Cup (SCCWC) 2019 is the first cricket world cup for street-connected children. The tournament is being organised by UK based organisation Street Child United (SCU).